Volthoom is an all powerful being who has demonstrated a number of powers such as: Reality Manipulation, Astral Projection, Cosmic Awareness, Dimensional Manipulation, Empathy, Energy Manipulation, Immortality, Invulnerability, Telepathy and Time Travel. 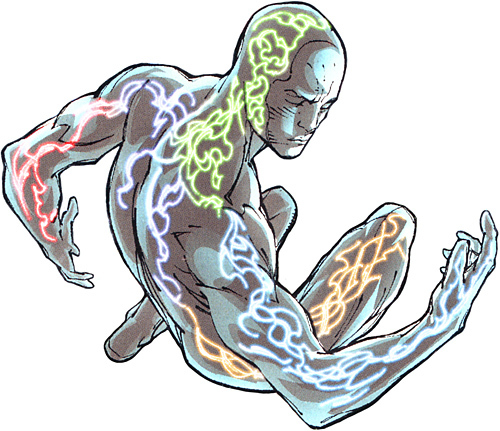 Volthoom was a male being who held mysterious origins that was dated back to an early point in the universe. This was during the height of the Maltusians civilization when they had developed their technology to its peak. At this point, the scientist Krona began his experiments in observing the beginnings of the universe. This was considered dangerous by this brethren as legend had forbidden it. After conducting the experiment, they observed a vessel emerging and a human-like figure within a spacesuit exiting who called himself Volthoom. This being seemingly tutored the other Maltusians in the power of the Emotional Spectrum and at some point he was given the name of The First Lantern. However, he was deemed dangerous and unstable by the nascent Guardians of the Universe who were threatened by his great power. Thus, it was ultimately decided to imprison him within The Chamber of Shadows located in a black hole where he was trapped inside a lantern-shaped construct. A number of Oans remained behind to ensure that the First Lantern was kept imprisoned and became known as The Hidden Ones whilst the remaining embarked on their mission of policing the universe with the Manhunters. The First Lantern's custodians and wardens vowed that he would never be released due to the dangers posed by him. According to Krona, the Guardians were responsible for betraying the First Lantern. His only legacy on Oa was within The Foundry in the area that stored the Power Gauntlet where an inscription made mention of the First Lantern. After the War of The Green Lanterns, the Guardians decided that their second army, the organic Green Lantern Corps, had failed as an interstellar police force due to the their emotions and free will. Thus, they decided to move to bring about their replacement in a group that they called The Third Army. To achieve this feat, they returned to The Chamber of Shadows where they were forced to battle The Hidden Ones for the First Lantern. Despite their former kin's protestations, the Guardians took the First Lantern and departed for Earth where they used the being's cosmic power to create the Third Army from the Oans own flesh. Once done, they dispatched their Third Army to convert organic sentients into more of their kind as part of a campaign to remove free will from the cosmos. During this time, the First Lantern demanded to be released and vowed that he would be freed whereupon he would torture as well as kill the Guardians. However, the Oans were adamant in ensuring the First Lantern did not escape and that they would remove him once he had served his purpose. Volthoom remained trapped in this state until the height of the Guardians plans in assimilating the cosmos with their Third Army where they tricked their Green Lanterns into an ambush on Oa. During the battle, the Third Army and the Oans fought not only their Green Lantern Corps but the White Lantern Kyle Rayner as well as Manhunters that had been reprogrammed by Atrocitus. The overwhelming onslaught led to the Guardians tapping more into the power of the First Lantern but this act shattered his prison, releasing him to seek his vengeance on the Guardians.